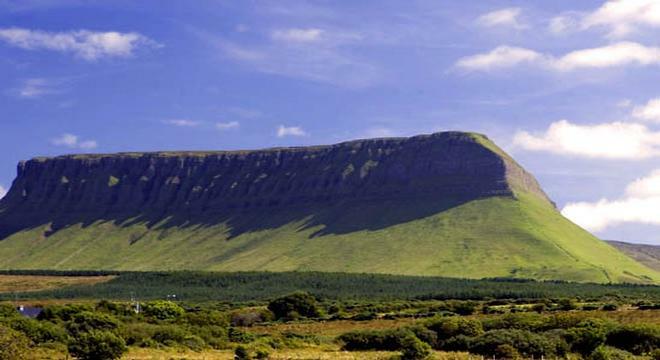 County Sligo has breathtaking mountain scenery, lakes, waterfalls and beautiful beaches. It is known as Yeats Country as it inspired many of the great works of the Nobel Prize winning Irish writer, W.B. Yeats. There are many sites of archaelogical interest in the area and one of the greatest concentrations of megalithic tombs in all of Europe. This is known as Carrowmore. It is one of the largest and oldest Stone-Age burial sites in Europe with almost two hundred tombs, a variety of passage graves, dolmens and stone circles still remaining. Overlooking Carrowmore cemetery on the summit of Knocknarea Mountain is a huge flat-topped cairn called Maeve's Cairn (Miosgan Meadhbha). The cairn is 55m in diameter and is 10m high. It was supposed to have been built for Queen Maeve, the Iron Age Queen of Connaught. Lissadell House is a fine example of Greek Revival Architecture and much of the house has not been changed since one hundred years ago. The Gore Booths have lived near Drumcliffe since the time of Elizabeth I and the present house built by Sir Robert Gore Booth is still their home. Like many Norman towns, Sligo had its castle and abbey. The castle has now disappeared but the abbey still remains and attracts thousands of tourists each year. As well as the vast history and magnificent scenery there is also a wealth of local legend. One legend describes how St. Patrick visited the area and wanted food. He was told that the river yield was poor in winter but nevertheless the fishermen tried and caught a large fish. St. Patrick blessed them and stated that the river would always have fish.